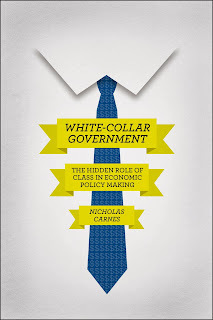 Nicholas Carnes is the author of the new book White-Collar Government: The Hidden Role of Class in Economic Policy Making. He is an assistant professor of public policy at Duke University's Sanford School of Public Policy, and he lives in Durham, N.C.
Q: Why did you decide to write White-Collar Government? A: I started working on this research a few years ago when political scientists were just starting to really understand how much more responsive government is to the rich than it is to the middle class and especially the poor. A lot of scholars were trying to explain why the rich have more political influence by focusing on differences in the inputs to the political process, like how the rich vote more often and donate more money to campaigns. Those explanations weren’t really panning out, though. The data were telling us that there was more to the story. I started wondering whether it might not just be the inputs to the political process that matter, but also who decides what to do with those inputs. I started looking at the personal backgrounds of politicians, and I realized that they weren’t just hearing more from rich people at the voting booth or in the form of campaign donations—they were very rich themselves. I wondered whether there was any hard evidence that politicians who are more privileged actually behave differently in office, and when I looked, I was surprised to find that there wasn’t. There was lots of conjecture—going all the way back to the Founding—but not any systematic research on whether it really matters that we’re governed primarily by rich white-collar professionals. So I decided to do that research myself. Q: Was there anything that particularly surprised you as you researched the book? A: I think the first big surprise was just how prevalent white-collar government is in our country. I went out and collected every source of systematic data I could find on the class backgrounds of politicians (what they did for a living before they got into politics). I kept seeing the same pattern in every level and branch of government and in every time period when I could find data. Working-class jobs—manual labor and service industry jobs—have always made up a majority of our labor force. But people from those kinds of jobs almost never make it into any public office. No one on the Supreme Court was a blue-collar worker. The average Member of Congress spent less than 2 percent of his or her pre-congressional career in working-class jobs. At least since World War II, no one from the working class has gone on to become President. The average state legislature is less than 5 percent working class. Even at the local level, workers make up less than 10 percent of the vast majority of local governments. And these patterns have been around for as long as we have data on them: since 1901, people who got into politics from working-class jobs have never made up more than 2 percent of Congress. That was a big surprise to me, and part of the reason that I wanted to write this book. I think another surprise was just that this topic hasn’t received more attention from scholars and activists. There’s lots of research on social class gaps in routine forms of political participation like voting or attending campaign rallies, and lots of research on interest groups and lobbying and campaign finance. And there are lots of advocacy groups working on all of these topics. And that’s fantastic—these are extremely important issues that deserve our full attention. But in this large community of scholars and reformers who care about political inequality, almost everyone was talking about how rich people vote more often or how rich people buy influence with interest groups and lobbyists—no one was talking about the fact that our political institutions themselves are all made up of rich people. Q: You write that "the unequal social class makeup of our political institutions affects who wins and who loses in the policy-making process." What are some of those effects? A: My goal with White-Collar Government was to bring together the best available data on how government by the well-off affects economic policy. The effects are pretty striking. Members of Congress who spent their careers in white-collar, private-sector jobs (in both parties) tend to vote more significantly more conservatively on economic issues than members from the working class, they tend to introduce more conservative bills, they tend to invest less energy in fighting to pass the kinds of bread-and-butter economic policies that most Americans care about, they tend to hold more conservative personal views about economic issues. The end result is that a wide range of economic policies are more favorable to the rich: business regulations are flimsier, social safety net programs are stingier, taxes are better for businesses and rich people and worse for middle- and working-class families. Government by the rich really promotes government for the rich, and that’s often bad news for the rest of us. Q: What accounts for the lack of lawmakers with blue-collar backgrounds, and is this pattern likely to change at any point? A: That’s the million dollar question right now. I think we can safely rule out a few possibilities: I show in White-Collar Government that there are lots of qualified working-class people out there who seem like they would make great candidates, and I show that voters tend to like working-class candidates when they run for office. Something seems to be screening these qualified working-class people out before they run, though. By the time you and I get to the polls, we don’t have the choice to vote for a working-class person: our options are usually limited to a white-collar professional or another white-collar professional. There are lots of ideas out there about what might be keeping qualified working-class people from running for office. Maybe they don’t want to run. Maybe they want to, but they have a harder time with the practical barriers to running, like taking time off work and raising enough money to finance a campaign. Maybe they aren’t being encouraged to run by political parties and interest groups. Maybe it’s all of the above. We’ve got a lot of suspects, and in the next few years I’ll be working to compile the evidence. There’s no smoking gun yet, but I think there will be in the next few years. And once we know what’s keeping working-class people out of office, we can start designing programs that help encourage more working-class people to run—we can start doing what groups like EMILY’s List have done for decades. We can start designing programs that make our political institutions look more like the people they represent. Right now I’m working on a big set of research projects designed to shed light on why there are so few working-class people in office. I just finished surveying all 10,000 of the people who ran for state legislature nation-wide in 2012, and in a month or so, I’ll survey all 6,000 of the people who lead the state and county chapters of the Republican and Democratic parties. I’m also mining existing data on the social class makeup of state legislatures to see whether there are times and places where working-class people have made progress in our political institutions. A: People who care about the fact that millionaires and white-collar professionals run our country don’t need to wait around for my new research to do something about it. There are already programs on the ground to identify, recruit, train, and support working-class candidates. There are union-run “candidate schools” in New Jersey and Oregon. There are similar outreach efforts in New York and Las Vegas. The key to success seems to be for progressive organizations to identify talented working-class people, encourage them to run for office, provide them with any training they might need (e.g., media training, etc. ), support their campaigns (with volunteers, seed money, etc. ), and then provide them with ongoing support once they get into office. These are activities that advocacy organizations all over the country already do for political candidates. Encouraging more working-class people to run for office isn’t rocket science. The people with the resources to help candidates just need to focus those resources on candidates from the working class. And the people who care about political inequality just need to start paying attention to the fact that the U.S. is run by a white-collar government. we can start doing what groups like EMILY’s List have done for decades. We can start designing programs that make our political institutions look more like the people they represent. Thank you for this interview on a very important subject.